You can find out about ALL of their attractions HERE. Our first stop was the Audubon Zoo! This zoo is one of the best zoo experiences I have had in recent years. We had a great time exploring the different regions and seeing all of the animals. We learned a lot about their Asian Elephants and were surprised to learn their ages; 43 and 54 years old! After talking with the staff, we learned that the brand new elephant living quarters is specifically made for geriatric elephants to include a soft floor that gives so it’s easier on their feet and joints. After Asia we toured the Primates Exhibit, the African Savanna, Louisiana Swamp, Giraffe Overlook, Jaguar Jungle, and the Aviary. We took a pit stop between the African Savanna and the Giraffe Overlook to let Charletta play on Monkey Hill. Monkey Hill is an AMAZING wading pool/waterfall playground. The kids can swim, climb and splash. It looked similar to a movie set with all the details and jungle-like features! Monkey Hill is also Accessible to wheelchairs, so all kids can get in on the fun! On our way back to the front of the park we stopped to ride the “Endangered Animal Carousel” and then let the kids play at the in-Zoo toddler park. We stayed there until they closed at 3. I could go on and on about how good our experience was, but I’ll get to the points. When you arrive at the Audubon Zoo you’re greeted with ample parking and a very large entrance facility. They have booths to purchase tickets, booths to purchase annual passes and then the turnstiles as well as some special event booths. The entry reminded me a lot of the entrance to Disney World’s Magic Kingdom with the same look and feel. More options and to purchase tickets go HERE. The food and beverage options were great! 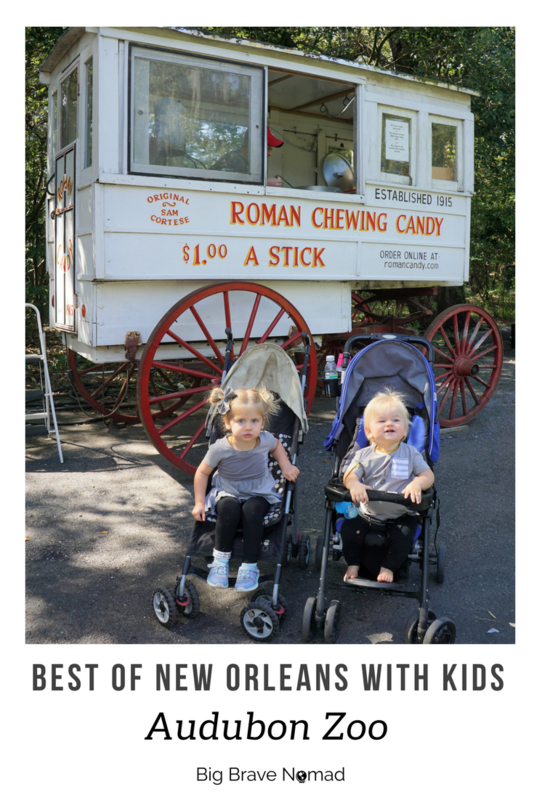 Directly past the entrance they had a small booth for meals and snacks, a larger dual restaurant centered in the park, another restaurant located in the “Louisiana Swamp” and smaller booths scattered around for ice cream, frozen lemonade, snacks and my personal favorite, Roman Candy. We purchased a chicken tender meal for $8 which fed both Jimmy and me. Plus, there were enough fries for all four of us. Both the tenders and fries were good and I would eat them again for sure! The prices were fair (especially for being a large attraction). The facilities were conveniently located throughout the park. Twice we had to ask where the nearest restroom was for our potty trained toddler. The first time we asked we were very surprised by how close the restrooms were (directly outside of the Primate Exhibit) and the second time we had to do a little more searching, but we made a wrong turn and that was our fault. Everything was well maintained and clean. I noticed each bathroom had a changing table too, so that was nice for babies! You can see her identification tag on her ankle! 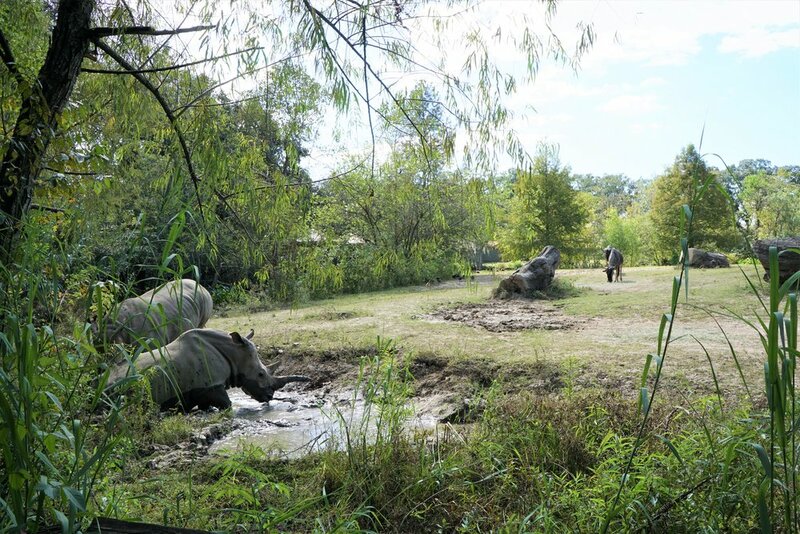 -Cool Zoo: The Zoo even has a small waterpark within the campus and you are able to take a lazy river past several exhibits. Learn more about the Cool Zoo HERE. -Nursing Room: The park has at least one dedicated Nursing station which has two rooms. The rooms have rocking chairs and are air conditioned (a huge perk for Louisiana heat). 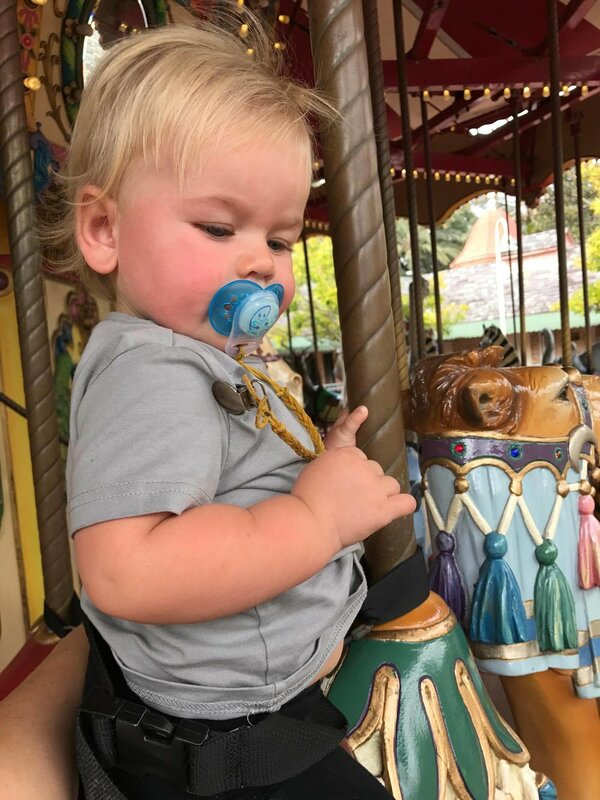 The nursing station is located close to a park and the carousel, so if you have multiple adults with you the bigger kids can play while you nurse. - Stroller & Wheelchair Rentals: You can rent from the information booth located at the entrance of the Zoo. Find cost HERE. - Child Identification Tags: The information booth also offers free ID tags for children. While none of us want to think about our children getting separated from us, it does happen. I asked the employee and she said these tags are utilized by the Security Guards regularly which means kids are getting separated. There is a place for the child’s name, your name and your phone number. Every single exhibit we went too was a full immersion experience. When you go over to Bambu Village, you feel like you are legitimately in SE Asia. Every detail was considered. I loved moving from region to region. The exhibits do a great job at easily identifying animals and giving brief, but valuable information about each one. 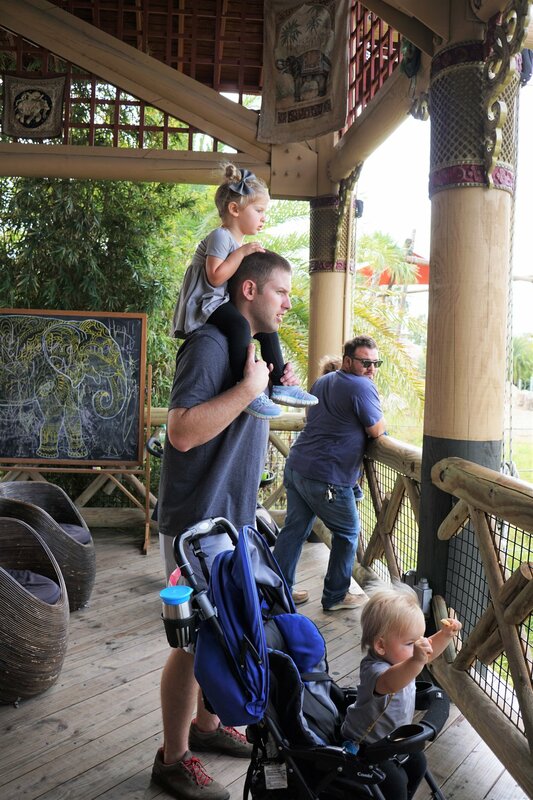 Our toddler really enjoyed every “world” – she loved seeing the Alligators in the Swamp, the Apes in the jungle, the Rhinos taking a mud bath and the birds flying through the aviary. Even at her height she was able to see without being held up which made it much simpler for her to explore on her own. (with us close behind) The zoo had either clear barriers or there was a nicely placed gap in the barrier for children to see through. Even our baby could see from his stroller seat. We have visited many other zoos where we have had to hold her up each time and by the end she just walks past everything. Monkey Hill from the top! There are two really cool places that stand out to me from our visit. 1) Monkey Hill: A small “splash pad” type area that is built into a hill. It has a couple pools and waterfalls and the kids can play on the entire thing. I really wish I had been a kid so I could have run and climbed through it. It was so amazing and looked like a jungle waterfall. 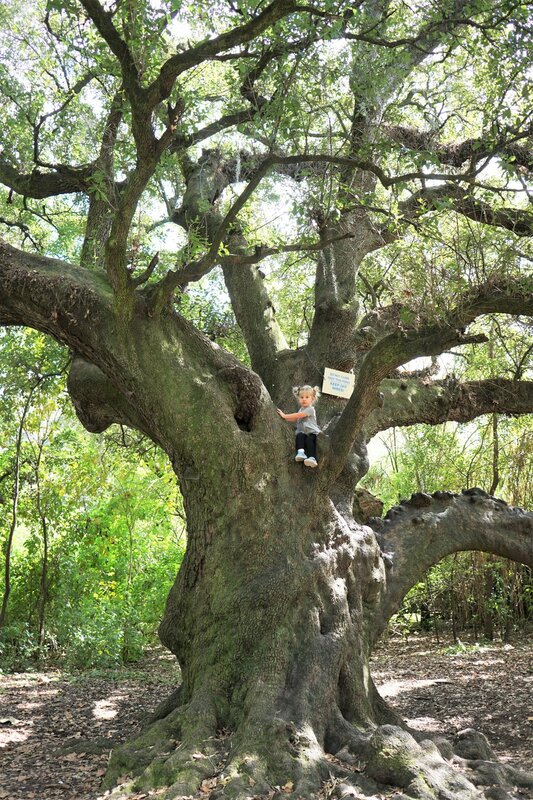 2) The Oak Trees: Located across from the African Savanna, there are two giant oaks. 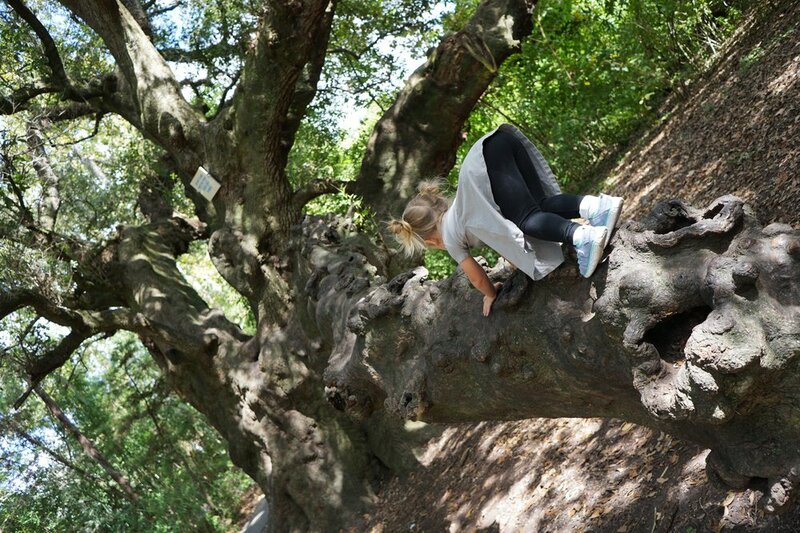 One of the Oaks is perfect for climbing. Our daughter went straight for it and climbed for about 30 minutes. It was a good, shaded break for all of us, but mostly just awesome for her to get to climb a majestic tree. We crossed paths or interacted with staff from the restaurants, entry, cleaning crew, exhibit crews, etc. Every experience was upbeat and helpful. Our daughter was playing on “Monkey Hill” when a worker started cleaning the play area. She took an interest and he let her help him skim the water. We have nothing but good things to say about the staff. 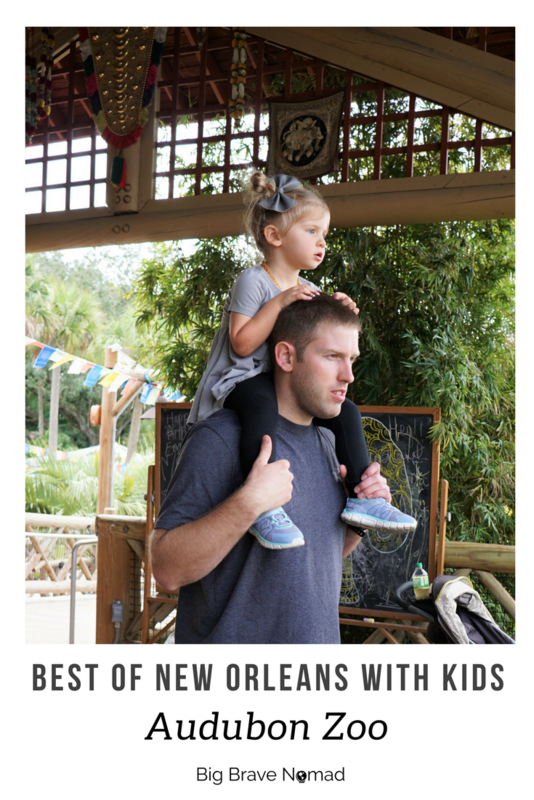 Overall, I HIGHLY recommend the Zoo as a must-see stop on your visit to New Orleans. This well thought out zoo has something for every age, including adults. Have you been? Let us know what you think!